Here is the latest Donna Remix track completed by myself tonight. There are some real magic moments on this album, such as Mystery Of Love, Tokyo (Which I already posted my mix here), Lush Life & If It Hurts Just A Little, to name a few. 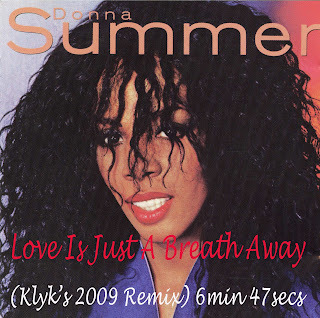 This particular track always screamed for a remix of some kind, to give it a more steady beat to dance to. I loved it in it's original form but never heard it played in clubs back in those days. So here it is now for 2009, hope you like it. Excellent, you've made it sound like a modern dance track while retaining all the appeal of the original production. Fan mix perfection! great, additonal keyboard gives a retro-vintage style. I LOVE MOST OF YOUR MIXES, BUT THIS ONE IS THE BEST, I PLAY IT OVER AND OVER, I AM FASCINATED, I WISH YOU COULD DO ONE FOR ¨EL VERDADERO AMOR¨¨SPANISH VERSION OF ´whenever there is love¨. THANKS.